With the deadline looming for Rainbow Waltz, and August-September being an incredibly busy month personally me (the editor). I can’t help but echo what cgcornett mentioned earlier, that Rainbow Waltz is going to be a pleaser for shoujo fans…when this title is completed. I am right now in the middle of editing chapter 6, and done a first qc for several chapters. One thing I notice that I would like to keep is the usage of ojousama -suffixes or the word itself. Ojousama is Japanese for Princess. In past works, I have tried to keep it simple and switch it all to English, but so far it seems easier to keep ojousama. I seriously believe that it makes the title or context sounds more romantic, though I haven’t read as much Korean manhwa to see if there is similarity between Korean and Japanese publications. Another thing, we at ISCRU is seriously seeking for, is reviewers for our publications. I was talking with cgcornett and contemplated on ethics of reviewing titles myself. I can fan girl gush mentally and to my friends about Hide and Seek all I want.. (also planning from my drafting board to write something about it eventually)… but all in all.. 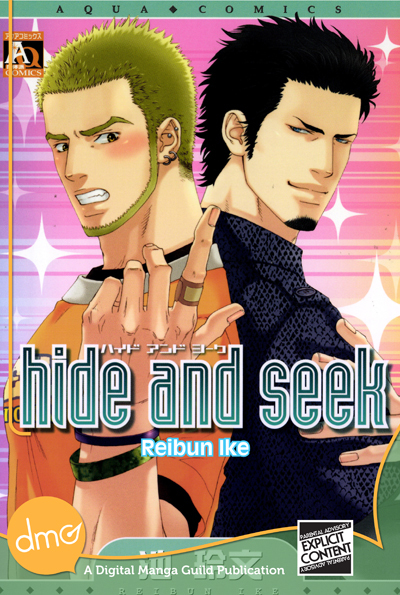 I wonder if there’s bl fans willing to review about Hide and Seek, a title that I definitely love. We’re also going to be asking for reviewers for future publications that we do. If interested please contact us at iscrugroup(at)gmail(dot)com. Hide and Seek is now available at eManga. Rainbow Waltz is translated up to c04 and cleaned to c03. Hope y’all have an AWESOME week. As of right now IS is seeking reviewers and people who would be interested in this book, so much that they buy it. As of this moment, still wanting to tell the world that this great bara book is finally legal and in English! When I have time… I would also be updating with a review soon… since this is a book I actually own in Japanese.